This is a system to tie together a lot of different types of information for special stages on rallies without a big effort. The data is tied together and put into a data base system to enhance the possibility for different types of analysis. It may be used by the race control, safety organization, and other officials as well as by the competitors. For competitors the option to get basic, very consistent pace notes, may be interesting. It may be of great interest for the public as well. As most information about stages is gathered in a database together with video and tools to carry out measurements it is an efficient way to file a complete event. The access to information is extremely easy and fast so the system gives a powerful tool to compare events from different years in a lot of aspects. Click at image to see full size. To get the complete system, with one sample stage you need to open this compressed file and follow the instructions below. The size of the file is around 530 Mb, so it takes a while to download it. * Toggle ON/OFF for an overview of all stages for current event. Zoom in/out with left/right mouse button. * Toggle ON/OFF for a map for selected stage. A trace will be marked red to the point where you have watched the video. Busy section are marked yellow. Click at the trace to go to a position. * Toggle ON/OFF for notes to be vocally called for selected stage as calculated by Jemba Inertia Based Notes System. * Toggle ON/OFF for a view of notes for selected stage as calculated by Jemba Inertia Based Notes System. * Toggle ON/OFF for a view of GPS coordinates for current position. * Toggle ON/OFF for a view of information from the road book. * Notes for the stage as calculated by Jemba Inertia Based Notes System will open up in your PDF reader. * Toggle ON/OFF for a plot of the speed profile for the stage as calculated by Jemba Inertia Based Notes System. The speed profile will be marked red to the point where you have watched the video. Click at the trace to go to a position. * Toggle ON/OFF for a plot of the altitude for selected stage. Plot will be marked red to the point where you have watched the video. Click at the trace to go to a position. * A view of the stage will open up in Google Earth (Must be installed (free from http://earth.google.com/) in your computer. Access to Internet is needed). All windows may be moved and resized as required. * Indication to what extent co-driver must advance his notes calls not to give late calls at a later position. * Toggle between WRC pace and pace at the time of recording. 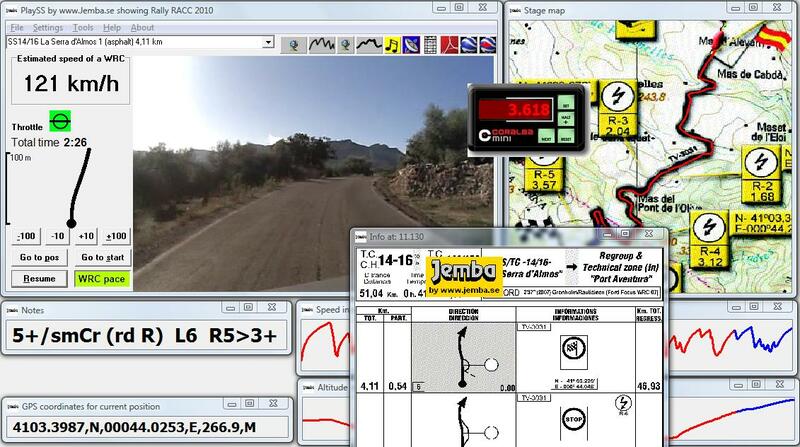 The WRC pace will show the stage at the pace, estimated by Jemba Inertia Based Notes System. 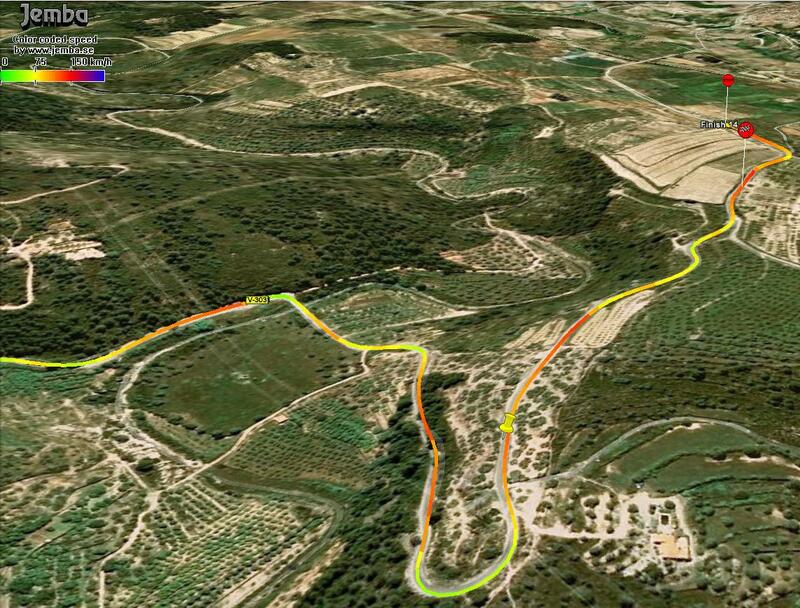 * Travelled distance along the stage is shown as a C-mini. It contains two registers that may be controlled independently, making it possible to measure intervals along a stage. Click at the display and you may move it to any position on the screen. Click again to set the new position for it. If video can not be seen you may need to install the codec for the type (AVI) of video files used. The Windows codec can be downloaded from here. If the video doesn't run smoothly or the dynamic tulip or icons flicker, you may need to run your computer in a faster mode.